Welcome back to the linky thats full of love, hugs and self care. I hope the week treated you well and please use the hashtag #thesatsesh on Instagram / twitter to keep us updated on your weekend antics. 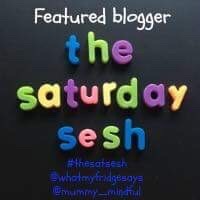 Tweet Share your posts on Twitter using the linky hashtag #thesatsesh and tag us in for retweets @fridgesays @mummy_mindful. Follow us if you don’t already please.